For the first time in decades, a number of Golden State Democrats are eyeing the next presidential race. DES MOINES, Iowa — California has a long history of bankrolling Democratic presidential campaigns. For the next one, the state appears to have a large contribution of a different kind to make — actual candidates. And they are already beginning to test the waters, at least a little. On a recent Saturday night in Iowa, two Golden State Democrats, Los Angeles Mayor Eric Garcetti and Bay Area-based Rep. Eric Swalwell, made appearances at the same event in this crucial presidential battleground, the Scott County Democrats’ Red, White and Blue Gala. “I guess you guys gave invitations to Erics from California and just wanted to see how many of us would come,” Garcetti joked in his remarks. It was the mayor’s first visit to the leadoff state in Democrats’ nominating process, Swalwell’s sixth. And more are heading that way. Adam Schiff, another California congressman representing parts of Los Angeles County, is due in the Hawkeye State May 1. Tom Steyer, a Silicon Valley billionaire, who’s spent millions of his personal fortune promoting liberal causes, will follow a week later for a visit that includes two town hall meetings as part of his “Need To Impeach” campaign against President Donald Trump. The state's junior senator, Kamala Harris, has not been to Iowa yet — or New Hampshire or South Carolina, for that matter; a trip last month to Nevada is her only one to a traditionally early-voting state. But she has been building her national profile through her work in the Senate, and will travel often to support fellow Democrats with visits like last weekend’s to Detroit, where she headlined a major Michigan Democratic Party dinner. None has formally launched a campaign yet, of course. 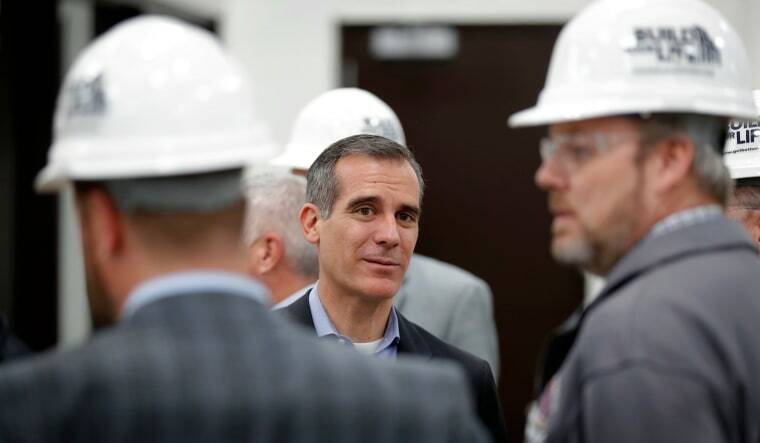 Garcetti told reporters he was in Iowa to “listen,” and was focused seeing what lessons he’s learned running the nation’s second largest city that could be applied elsewhere. Swalwell, who like Schiff has drawn national attention for his work as on the House Intelligence Committee’s Russia investigation, cast his latest Iowa visit as focused on 2018, not 2020. “I came here because if we win Iowa this November, we win Congress,” he said at the Davenport dinner. It’s been more than two decades since a California Democrat waged a serious campaign for the presidency — then former-Gov. Jerry Brown, in 1992. But it’s no surprise that it may field multiple candidates this time. The state has been a chief antagonist of President Trump, challenging administration actions in court and fueling the so-called resistance movement. The president in turn has described California as “out of control,” especially for immigration policies he says have put the nation at risk. He tweeted about California five times in the last week alone. And the pipeline of rising stars from there seem eager to take the fight to Trump beyond its borders. Garcetti arrived here one day after scoring a victory against the president in court. A federal judge sided with the city as it argued the Trump administration couldn’t link eligibility for grant money to cooperation in immigration enforcement policies. Dianne Feinstein’s decision to seek a fifth full term in the Senate in 2018 cut off one potential path for ambitious California Democrats. And in an unpredictable political climate, the Democrats’ overall 2020 field could be larger even than the 2016 Republican crop that produced Donald Trump as its nominee. In such a climate, many are asking, why not? Swalwell told NBC News he thinks it would be good for the party to have a large field, regardless of where they come from. That doesn’t necessarily mean the Californians aren’t putting their state front and center. Swalwell has often called attention to his Iowa roots during visits here — he grew up in Sac City and Algona before his family moved west. “We’re about the politics of addition and multiplication. And I think Iowa — that resonates, too,” he said. For his part, Gov. Brown, asked to weigh in on the Democrats’ 2020 field during a visit to Washington this week, said that “a new leader has not emerged” yet. And when asked about his own political future, said he “wasn’t riding off into the sunset” — and even seemed to keep the door open to a fourth White House run.